as something that only happens to married men. You know, the stereotype where a husband hits 40 and starts wearing garish clothes, buys a red Corvette and chases 25 year-old blondes around town. None of that for me, I don’t yearn for a personal cabana boy – my marriage is great, thankfully. BUT, I DO find myself starting to redefine what the term midlife crisis means to me. To me, after years of raising kids and putting everyone else first… I’ve started to realize that the sands of time are slipping through the hourglass and it’s time for.. well, it’s time for “ME” time! It’s time for me to start living a little. Nothing too crazy. I just feel the urge to let my hair down more (or at least stuff it in a DOT certified helmet). 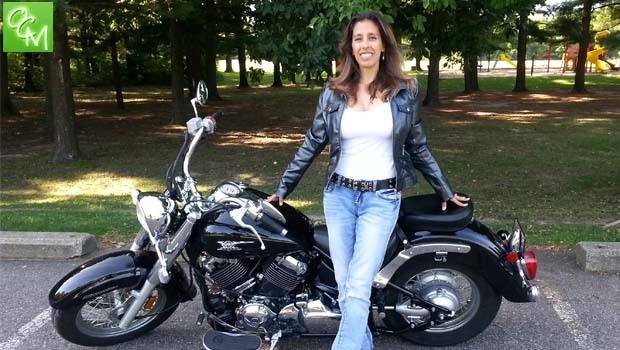 I went from midlife crisis mom to motorcycle mama! My husband (likely on a midlife crisis of his own) purchased a motorcycle a few summers back. Once he got comfortable enough learning his way on this thing, I would join him for some late-night rides. I’ve been told I’m crazy… hopping on the back side of a motorcycle with a newbie, but every second of every ride has been worth it. It’s a whole different experience of the fresh outdoor air combined with a thrill that gives me a high with every ride. I’m not sure who loves his motorcycle more – me or him. Because I found myself loving the late-night motorcycle rides so much, I thought I’d give it a shot and try learning how to ride the motorcycle. My husband taught me the basics and I practiced around the block and in parking lots. Let me tell you, I can completely understand those clips on America’s Funniest Home Videos when people lose control of their motorcycle and find themselves crashing into wooden fences and such. I didn’t quite crash into anything, but it was definitely rough. Had I video taped my lessons, I’d share the comedic experience with you. However, I was nervous enough at the time and couldn’t deal with any cameras. After some practice and studying my tail off, I headed off to the Secretary of State and aced the written exam. Then I took my temporary permit to a driving course and passed that test – holy cow! I am now certified and have a license to drive a motorcycle! I was so thrilled I headed home to take the motorcycle out for a spin. My husband’s bike is much too big for my 5 ft 3 frame (my feet could barely tough the ground), so I bought a brand new motorycle and my Midlife Crisis Mom to Motorcycle Mama is now complete. If you would have told me even a couple of years ago I’d feel like I was in the midst of a mom midlife crisis or that I’d throw caution to the wind and become a motorcycle mama, I’d have said you were crazy. I went from midlife crisis mom to motorcycle mama! Getting out and exploring life riding (or riding on the back of) a motorcycle has been one of the best things to happen to me in recent memory. As far as a midlife crisis goes, I’m (finally) having the time of my life! Stay tuned…I’ll be sharing some late night ride stories and my hopes and dreams of buying a smaller bike that I can manage. I’m also planning some midlife crisis mom girls night outs and weekend getaways with my BFFs! Are you a midlife crisis mom looking to break out?